Ok not strictly out in the UK yet, but managed to get hold of it on my phone... This app is going crazy in the US apparently. Anyone else going to get it? Already caught me a Bulbasaur and a Rattata this morning. Should tide me over until Pokemon Sun & Moon come out in November. Join in... Be one of the plebs. I picked it up over the weekend on my US iTunes account. I am rubbish. Can't wait till it comes out. Decided to wait and not download the APK file. Don't fancy ******* up my phone for an app I could wait a week or two for. Any news on a release date yet? I have got it on Android. Do you not get to battle them any more before I capture them?? Or am I being thick? 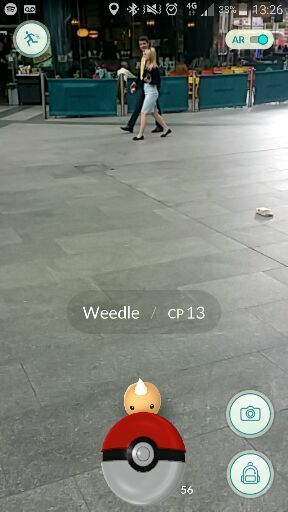 Got a pidgey and a spearow thing at West Croydon this morning...surprised I didn't get a grimer to be honest! I downloaded it no problems for my note4 been drama free. No problems with it thus far. My phone is due an upgrade soonso no real issues for me if it ****s up. Everyone's going on and on about this at work. looking forward to getting this, but will wait until it's officially out in the UK. Only reason why I am cautious about it is because I have had just had an upgrade. What are the servers like at the moment? As much problems as what has been reported? No Battling unless in gyms. Hopefully alot of the bad will get better with updates. I think Niantic have already said that trading and more Pokemon will come soon. So it's just the servers and battles I want. they didn't realise how popular this would be. it's added 5.7 billion to Nintendo's market value since it went live. This might do it though, I'm definitely intrigued. It's a mess because it had stuff from the living room and hallway in there whilst I clean the carpetsin the living room. Got the Vicar coming round tomorrow.